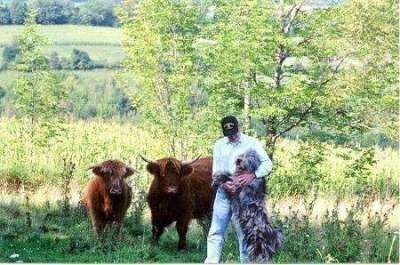 The Bergamasco Sheepdog is an ancient breed that is at least 2000 years old. The ancestors of the Bergamasco spread out along the Alpine chain. 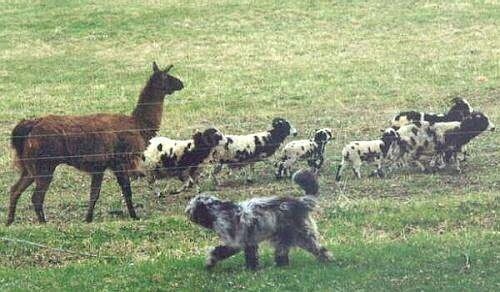 Ancient dog lovers speak of a dog of the Alps and some describe a sheepdog in the Vallese region. The only common element in these vague sources is that the coat is described as long, thick and shabby. Strong, sound and brave, this dog is also very intelligent and has a good equilibrium. The Bergamasco is a medium size dog, well-proportioned and harmonious, having a rustic appearance. He is a solidly compact dog with a strong, powerful build that gives him great resistance without taking away any of his agility or speed of movement. His imposing aspect is increased by the thick coat which is one of his typical characteristics and makes him different from any other dog. The Bergamasco’s coat is characterized by three types of hair which are abundant and form mats or flocks, which are the distinguishing characteristic of this breed. The mats start from the spine and go down the flanks, growing every year to reach the ground. The thick curtain of hair that covers the eyes has a functional purpose as well; it serves as a visor so as not to be dazzled by the sun reflecting off the snow in the mountains. The color of the coat can be anything from gray or silver gray to anthracite (coal color). This color served as a camouflage when working in the mountains. The entire hereditary pattern is deeply ingrained in the breed. Even in our modern times, the Bergamasco remains the same. Strong, sound and brave, the Bergamasco is above all very intelligent and balanced. The intelligence of the dog has been refined for natural selection. Being alone with hundreds of sheep to look after and having to sort out different and unexpected problems caused the Bergamasco's intelligence to develop steadily. The Bergamasco is a peaceful dog. Puppies play together nicely. Attentive and reserved, it participates constantly in everything that goes on around it and, even when it appears to be asleep, its eyes will be following you, because it always wants to know where you are and what you are up to. Although not instinctively aggressive, the Bergamasco is an excellent watchdog because it doesn't like strangers invading its world. Its relationship with children is something special. Their presence awakens its most profound and primitive instincts, first as a wolf and then as a sheepdog. Patient, tolerant, attentive and protective, it seeks their company, encouraging their games and establishing true friendship with them. The Bergamasco is both a watchdog and guard and will alert when people come to the home, however, the Bergamasco is not aggressive as long as there is no serious threat to the family. 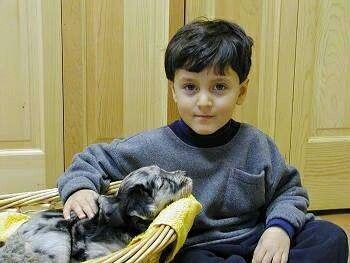 The Bergamasco is great with all children and has been used as a therapy dog for handicapped children. Bergamascos are usually okay with other dogs as long as they don't challenge them or appear as a threat. They will usually do okay with cats, but it is best if they were brought up together while the dog is still a puppy. The Bergamasco sees each individual that comes to the house as a separate person. As to whether to Bergamasco is friendly with strangers, all depends on the feel of that person and what the dog senses. The Bergamasco is not a dog for everyone, but with the right owner, is a true pleasure to own. Bergamascos need an owner who displays an air of authority over the dog. Not harsh, but calm and firm, setting rules the dog must follow and being consistent about them. This is not a dog for the meek or passive owner. He does best with natural leadership. Height: Males 23 ½ inches (60 cm) (with a tolerance of 1 inch (2 cm) either above or below). Females 22 inches (56 cm) (with a tolerance of 1 inch (2cm) either above or below. Usually a very healthy breed. The Bergamasco Sheepdog is best suited for seasonal to cold climates. Given its dense coat which provides protection from the elements of the climate, it is not uncommon to find the Bergamasco spending its nights sleeping outdoors. The Bergamasco Sheepdog would not do well in apartment living, rather a house with a yard to provide for daily exercise. The Bergamasco enjoys the outdoors and will exercise on its own accord if it lives and works on a large farm. A long daily walk, herding the sheep or a romp with the kids is ample exercise that is necessary for a happy Bergamasco. The Bergamasco coat once fully flocked requires very little care, except for occasional brushing and bathing. The coast is forever changing, from the adorable, soft, fluffy, puppy coat to the beginning flocking stage which may start as early as 8-9 months to 1 year. When the flocking starts, it lasts until the dog is approximately two years old. From 2-3 years the coat is settling into a flocking pattern and will continue to grow throughout the dog’s life. The coat is made up of three types of hair: the undercoat, which is fine, dense and oily (not greasy) to the touch and forms a waterproof layer; the goat hair, which are long strands of harsh hair similar to the coat of a goat; and the woolly top coat, which is finer and softer to the touch. The combination of the woolly hair mixed with the goat hair weave together to create the flock. These flocks continue to grow throughout the dog's life, creating multi layers of flocks that magically appear before your eyes, eventually reaching the ground at about the age of 5 years. The Bergamasco is a very simple, genuine dog which is reflected in his coat; it is best to let the coat develop as naturally and spontaneously as possible. The Bergamasco does not shed like other breeds, however, at times, like humans, you will find hair, especially during the puppy stage. Once the coat changes from puppy to adult and the flocks are set, hair loss is minimal. The Bergamasco coat is considered hair, not fur and is considered non-allergic, however, there are extreme cases that a person could still be allergic to the hair, depending on the type of allergy. See Grooming the Bergamasco for more details. 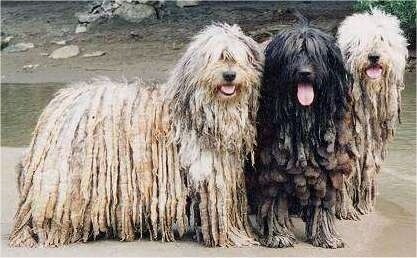 Bergamasco coats grow with "flocks" (the cords) for a specific reason: the coat acts as an insulation for cold and warm, and the wiry goat hair that grows into the undercoat and the woolly coat at a year old weave into the former to create this unique characteristic that has developed naturally over the course of centuries. If the coat is shaved or clipped the wiry goat hair no longer weaves into flocks but instead in homogenous giant mats that are almost impossible the comb out. By doing so, the skin which is always visible at the base of the cords is completely blocked. The Bergamasco skin produces a tremendous amount of oil to lubricate the long cords, keeping them clean and odor free. By blocking the oil next to the skin, the skin tends to rot or mildew since it is not allowed to breathe and clear the oils, creating infections, skin rashes, and hot spots. For those people who want a shorter coat, they can keep the dogs in a sporty coat. That means keeping the cord, but in a shorter length (4 to 5 inches instead of to the ground). That way the skin and coat continue to work in the natural way these dogs have evolved to be while allowing the owners to have a more manageable coat. The Bergamasco has ancient origins. In fact, it comes from that stock of shepherds and cattle dogs that spread from the Orient to the Western world after migrations of the nomad populations and their herds. The exchange of the dogs took place when the sheep were sold. 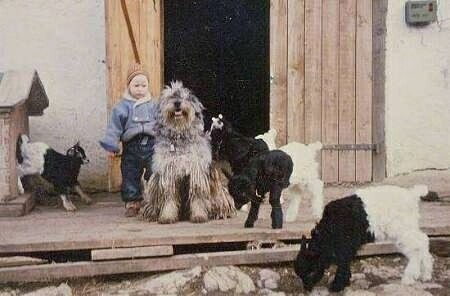 The progenitor of the Bergamasco Shepherd found its most suitable cradle in our country in the territory of the Alpine Arc, where sheep herding was very developed, and in the Po Basin of Piedmont and Lombardy, where they went for wintering. The Bergamasco was selected exclusively for its work aptitude and for a long time its bloodlines were kept a secret by the shepherds. The breed was officially recognized by the AKC in 2015. Section 1 (Sheepdogs) without a working trail. Many thanks to Donna DeFalcis from Silver Pastori Bergamascos for providing information and a lot of wonderful photos, making this section possible.